Finding the right tire for your vehicle isn’t always easy. There are hundreds of tire brands to pick from and thousands of tire styles. Narrowing you choices down to one brand, or a handful of brands, will help you not feel overwhelmed with options. One such brand you should consider for high performance vehicles and sports cars is Continental Tires. It is a top brand that is fitted as original equipment (OE) on hundreds of new vehicle models every year. The brand is among the more expensive performance tires, but has a reputation for precision German engineering, innovation, quality and high performance to back up the higher prices. My personal experience driving on Continental performance tires, and the consumer reviews that I have found about Continental performance tires, are positive. The brand also ranks well in Consumer Reports’ testing, and has won many JD Powers Awards for Customer Satisfaction. However, not all Continental performance tires are created equally. A clear idea of what you are looking for in your next set of tires is key to making the right decision. To do this, you need to evaluate your experience and satisfaction with the tires on the vehicle currently. Did you ever find yourself in a driving situation or accident avoidance manuever where you felt the tires lacked grip? What type of weather is most frequent in your area, and causes you the most amount of concern while driving? Is winter weather severe in your area, and could you benefit from having a set of winter tires to go with your summer tires? How many miles, or how long did your current tires last? Did they fall short of the manufacturer’s mileage warranty, or your expectations for durability? Any noise, or ride comfort complaints that you think are caused by the tires? Are you going to sell the vehicle in the next year or so? If the answer to the questions above is “no” or “none”, than you should consider replacing the tires with the exact same tire style that is on the vehicle currently. All the tires that come fitted on the vehicle from the factory as original equipment should be available through any of the retailers in the brand’s authorized dealer network. The issue you may run into is availability. Dealers tend to push the replacement tires they have in stock. Given the huge number of tire sizes and models, it is unlikely that even a large authorized brand retailer will have the exact OE model and size in stock. For this reason, if you are choosing to replace the tires with the OE tires, you can save yourself time and money by buying your tires online. The tires can be shipped to the installer of your choice directly. All you need is the tire brand, model name and all the size detail found on the sidewall of the tire. For example, Continental (brand) ContiSportContact (model) 205/55ZR16 (size and Z speed rating). 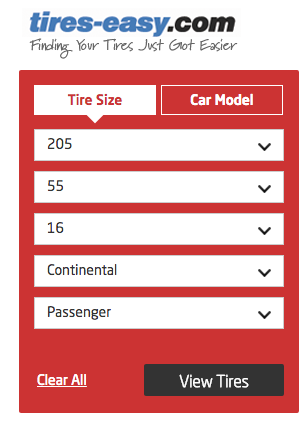 Armed with this information, it is a simple process to find the exact same tire model and size using one of the tire search tools on one of the online tire retailer websites. The above info-graphic illustrates the performance differences of three tire styles from the same brand and designed for the same type of vehicle. Each tire has a slightly different combination of tread pattern, rubber compound and internal construction. This adds up to different levels of performance on attributes such as tread-life, dry grip, wet traction and handling. For example, you can see the Continental PureContact has a touring ride and handling orientation, with more emphasis on mileage and a quiet ride. The ExtremeContact DW is a sport summer tire with maximum grip for really spirited driving on the open highway and twisting roads. The Continental ExtremeContact DWS has many of the same performance attributes as the ExtremeContact DW, but with even more all-season traction. (The “S” in the style name stands for Snow). 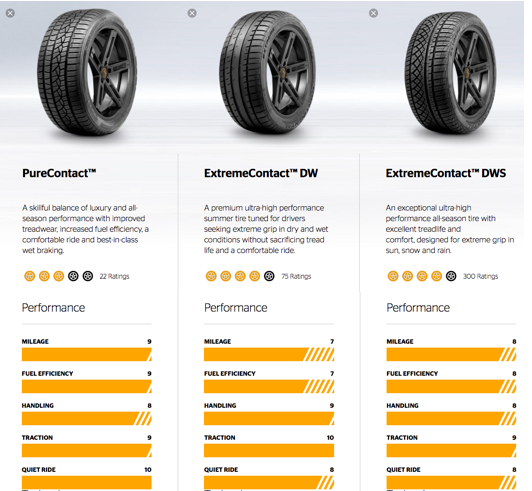 There are plenty of online tire comparison tools to help you narrow the available tire styles of any particular brand like the Continental example above. There is no need to default to the tire that came on the vehicle. Just a little time spent researching your tire brand of choice, on a site like tires-easy.com can help you find a replacement tire that fits your needs and driving style to a T.